The Trump administration and the GOP are trying to turn Texas police into agents of oppression against immigrants. But many Texas cops aren't having it. Deep in the heart of "red" Texas, law enforcement officials have taken a stand against recently passed state legislation aimed at requiring local police forces to essentially become arms of the federal Immigration and Customs Enforcement agency (ICE). Citing the important role of trust between police and the communities they serve, the chiefs of police of Houston and Dallas penned an op-ed, published in the Dallas Morning News, in which they call out the legislation as "political pandering that will make our communities more dangerous." The column was co-signed by the police chiefs of Austin, Arlington, Fort Worth, and San Antonio, as well as the executive director of the Texas Police Chiefs Association. Officers would start inquiring about the immigration status of every person they come in contact with, or worse, inquire about the immigration status of people based on their appearance. This will lead to distrust of police and less cooperation from members of the community. And it will foster the belief that people cannot seek assistance from police for fear of being subjected to an immigration status investigation. Distrust and fear of contacting or assisting the police has already become evident among legal immigrants. Legal immigrants are beginning to avoid contact with the police for fear that they themselves or undocumented family members or friends may become subject to immigration enforcement. Such a divide between the local police and immigrant groups will result in increased crime against immigrants and in the broader community, create a class of silent victims, and eliminate the potential for assistance from immigrants in solving crimes or preventing crime. Under the proposed law, Texas police departments — including campus police departments — may not "materially limit" any police officer from asking the immigration status of any person "under lawful detention." In other words, if police stop someone for a busted taillight or just questioning on the street, they are empowered to ask their immigration status. In addition, the law would impose fines, jail time, and job loss as possible consequences for police leaders who actively discourage their officers from inquiring about immigration status. Comparing the law to a similar and controversial Arizona law, the executive director of the American Civil Liberties Union of Texas, Terri Burke, observed, "A state that prides itself on its commitment to individual freedom is about to become a ‘show me your papers’ state." 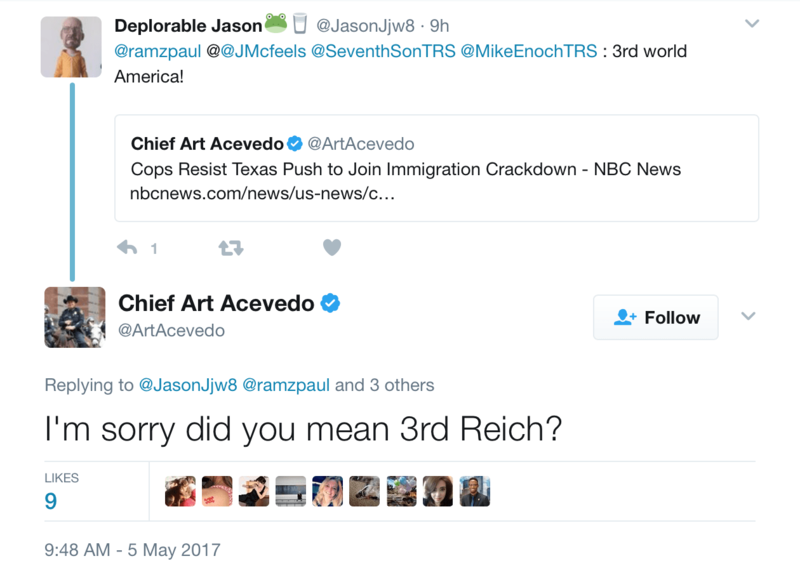 Appearing on Univision, Acevedo attempted to comfort the Latino immigrant communities of Houston, saying, "No tenga temor, no le haga caso al teatro político," translated as, "Do not be afraid, do not mind the political theater." However, an unknown number of Texas individuals and families are afraid as a result of this law and the general climate against immigrants since the election of Donald Trump. I live in Houston, and I recently spoke to a Latino friend my family has known for more than a decade, asking how the climate created under the Trump administration was affecting him. He revealed that he was, in fact, undocumented, and had come to Houston with his parents as a young child. Because of a minor non-violent offense when he was young, he has a criminal record and is ineligible for citizenship. As a result, he now drives only to and from work. He otherwise remains at home out of fear of being pulled over in a traffic stop and being deported. He told me that he and his wife, who is also undocumented, recently retained a lawyer to draw up papers that authorize the school their three young children attend to release the kids into the care of a designated guardian if he and his wife are unable to pick them up because they have been detained by ICE during a school day. Many families he knows are doing likewise. Their lawyer even explored the possibility of their divorcing and marrying United States citizens to safeguard their family's residency. Despite living in Texas for their entire adult lives and being productive members of their community, this couple and their children now live in fear every day, along with countless other families. Fortunately, the courage and resistance by the leaders of many Texas police departments give such families hope. Similar to Austin's Sheriff Sally Hernandez, Houston's Acevedo defiantly acknowledged that, should it be enacted, the "show your papers" law was likely to have little impact on how he chose to run his department. Summing up the true and morally depraved purpose of the law, Acevedo observed, "Why are we passing this law if it will have no impact other than to ... create fear? If that's what were trying to do – scare people – then shame on us." Previous articleSurvivors react to GOP health repeal: "I'm almost as upset as the day that I was told I have cancer."